I had thought of attempting a couple of deja vu entries - NicoBlue's Quasi, Breeee123's Hoops and Alexsaberis Del Primo Christo. Quasi will be in my outtake folder. While contemplating Alexsaberis shot I decided to do an original. I nailed woody to the cross and stood it up in that green florist brick foam stuff. A red posterboard in the background is lit by two desk lamps with flood lights from either side to give the glow and gradient. A small 25 watt light was used to light the front of woody. The crown of thorns is made of green florist wire wrapped in 5 strands and then clipped some to make the thorns. This is one of the first entries i have that was taken in RAW format. I did some editing from RAWSHooter first - sharpen, saturation, exposure, and probably a couple other basic editing techniques. Once in PS I went to town. Cropped, burned and dodged a ton, saturation and a slight hue adjustment, curves, cloned out a bit of the crown, blurred the background, blurred various parts of woody, levels, high pass filter and soft layered, USM a couple of times, NI several times, and a bit of cloning to clean up some lines on woody. Please dont ask me for detailed and ordered steps cause I cant even come close to remembering. This shot is heavily processed but I think I achieved a good look and end result. I am very pleased with this shot. I am a Christian and Christ is my Lord and Savior. I wanted this shot to be an emotive capture rather than a humorous one. There is no humor meant in this depiction and I hope that it taken that way. I realize that I may get some low votes for the material used - but I am totally cool with that. I will be honest - I have been pleasantly surprised with the placing of some of the past Christian themed entries and I hope that this will be one of them. Post Challenge - Wow - 26 votes under 3 and I still pull off a 6. Cant say that I am not dissappointed in my placing but I knew this was going to be a tad controversial. Still - I am very pleased to have this image in my portfolio. I also agree that this has been taken in the very best way re all of the faiths. Message edited by author 2006-11-03 19:11:43. Tim, I'll add my voice to congratulating you on speaking your faith publicly. Just ignore those low voters. It's a nicely done shot, very tasteful and sincere. I don't care much for woody shots, so I didn't enter or vote this challenge. I do have to say this was very nicely done. Sorry about your low votes, but there are some very narrow minded people here. WOW, just looked at your score. 23 under 3! 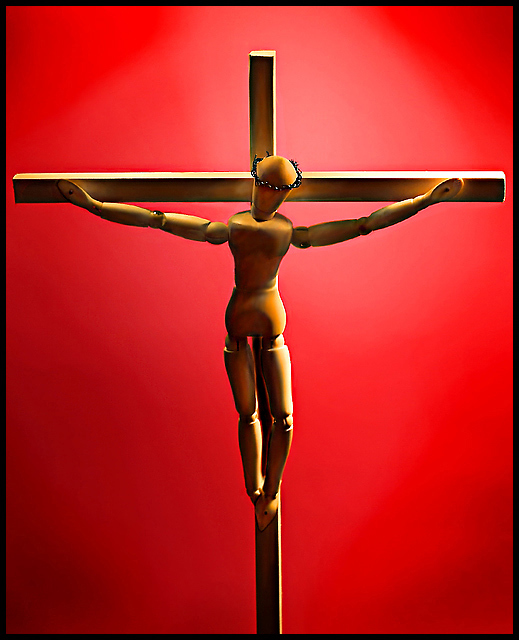 Sometimes I think its hard to see things (woody) or other people on the cross other than Jesus Christ. I like it though. Keep up the great work my friend! And lets never stop talking or taking pictures with Jesus in them! Tim, thanks again for your courageous image and clear testimony in word. I hope that we all can view it again in the intended light, and appreciate it. Tim very nice image. It is a great score considering. This season was awesome and I thank you again for being my teammate. It is a pleasure. I don't think there is even a trace of "poking fun" conveyed in this photo! It's beautifully done, and it always touches me and means so much when people speak their faith in their photography, or in everything they do for that matter! I've been so busy, I didn't get a chance to vote on this challenge, but if I had, you definitely would have had 17 10's! And the main thing: I think your Savior is pleased and proud of you and your tribute to Him!!!! Post Challenge - Wow - 26 votes under 3 and I still pull off a 6. I guess it was going to inspire or alienate people Tim, I can see what you were trying to do, but perhaps, who knows, perhaps some people thought you were poking fun. Because I know your character and beliefs I understand it, but during voting we don't know who is who and so it could have been someone being blasphemous...we spoke about that through our PM's. I was surprised this one didn't do better; I was expecting at least a top 10 finish if not a ribbon. Fantastic idea, your representation of the sacrifice Christ made was summed up perfectly in your title, as was the use of a red background symbolizing the blood of Christ. Thanks for sharing your faith. I must say I completely agree with landcamera. I felt the tone of the shot and the title made it very clear that this was not a sick joke. I am utterly flabbergasted at the 26 votes of 3 and under! I'm afraid many voters (as usual) were unable to separate their feelings on the subject from rating the merits of the pic. For shame! This should have finished WAAAAAAAAY higher. Message edited by author 2006-10-18 05:52:59. As a Christian in an often-hostile-to-Christian community, I was not sure if this was poking fun or if it was meant as a legitimate symbol of your faith. Glad to know it was the latter. Either way, I gave it a 7 for it's photographic quality mainly. I'm still not wholly comfortable with the image since it's hard for me to separate Woody from humor, but I am adding to my fav's just as a reminder to be bold in my faith as you have been. Message edited by author 2006-10-18 00:33:07. Bold statement! Good lightning and very appropriate background colour. Awesome shot Sweetie! I know this was a heartfelt shot for you and I'm sorry you endured so many comments that suggested anything less. I know where your heart is and so does our Lord and Savior...that's all that matters. Good job! I love the lighting!!! 10 for sheer cojones, and actually it's a good picture, too. It would make a good ikon. Nice idea, red color, lighting, good execution - pun intended only as it is redeemed by grace being poured out. I'm wondering about different composition and perspective, but the image is still simple, powerful, and effective. Well done, my good and faithful servant. (note to self: look past subject matter) There are bright spots on the arms of the cross that are very distracting and pulls away from the image... as I look the left side of the image is also as bright and very distracting. It looks like a pixel line from editing or such. Looking at it more, the figure itself looks very odd. I was going to say I liked the red background but it may be making the figure virbrate, unless that is the effect of too much USM. You missed the message of Christianity: a sinless sacrifice was required, and Woody does not qualify? I already voted, so I won't change my score - gave you a 6 on first pass. I do think this is very tastefully done - quite delicate, actually. A bit blown on the right, but I like blown - just not sure everyone else does. Nice background. i think the strong contrast works, here. Not sure I like the red background or the harsh light/shadows but the idea is creative. Some people might not like this because they don't like the religious message. Some people might see it as making fun of something sacred. But I just want to say that I am in neither group, and, assuming that this image is entered with good intentions like I think it is, I support it 100%. Proudly hosted by Sargasso Networks. Current Server Time: 04/19/2019 04:15:52 PM EDT.